Discover Art at Your Neighborhood Library with Virtual Reality! Wed, August 22, 2018 5:30 P.M. Discover Art in this 2-Part Program! Visit South Philadelphia Library to look at the Barnes’ collections of art from around the world with Virtual Reality (VR) headsets. Sign up to attend one of two offered sessions. Light snacks will be provided! 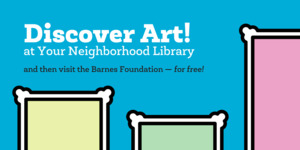 Session attendees and their guests will then be invited to visit the Barnes for free on September 8th. Free Septa passes will also be provided! Please note: You must take part in a workshop in order to visit the Barnes on September 8th. Spots are limited, and registration is required. The visit to the Barnes will involve 10-15 minute walks to and from Septa stations. This program is FREE - Call or stop by the library to register. Note that VR headsets may cause disorientation and dizziness, so those prone to motion sickness should take care when using a set.